The Met’s 82nd & 5th app is a signal for new things to come from the largest art museum in the U.S. The Metropolitan Museum of Art was founded in 1870; its mission is to collect, preserve, study, and foster appreciation and knowledge of works of art that “collectively represent the broadest spectrum of human achievement at the highest level of quality.” The Met’s two million square-foot building on Manhattan’s Upper East Side houses over two million objects. At any given time, tens of thousands of objects are exhibited. Over 6.7 million people visited the Met last year. 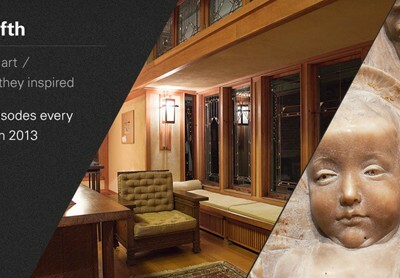 Its collection is global, with significant holdings from many cultures and countries. With its huge physical plant, extensive collections, and large audience, the Met is among the world’s largest art museums. In recent years the Met has invested in media of all kinds. 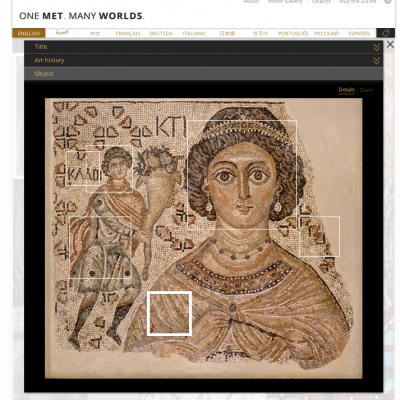 A digital media staff “manages electronic documentation and digital assets associated with the Met’s collection,” and develops multi-media content that supports learning and dissemination of the collection, both on the floor of the museum and online. The staff’s active blog offers behind-the-scenes insights into the development of digital capabilities at the Met and the MediaLab page offers highlights of recent experiments. In 2013, the Met released its first app for iPad, iPhone, and iPod Touch, called 82nd and 5th (the museum’s location in New York City). Unlike many apps, there also is an online version viewable on the Met’s website. The app was launched with fanfare befitting the Met’s scale, and was reviewed favorably in part because it may point to more robust interactive uses of the Met’s collection in future iterations. Writing in Forbes, Contributor Seth Porges said, “I’d be shocked if the current app didn’t reveal itself to be a stalking horse for something cooler down the line.” The app was released in 12 languages. Another recent release is “One Met. Many Worlds.” This multi-lingual, interactive web feature invites digital audiences to pair objects from the Met’s collection and then share their pairings with other visitors via Tumblr, Facebook, and other social media. 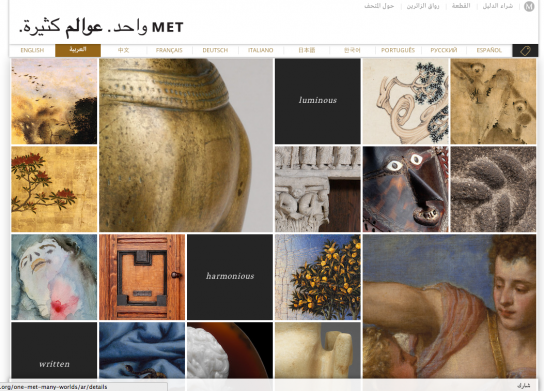 The Met is active in social media, with large followings on Facebook, Twitter, and Instagram, in particular. The Met won the 2014 Webby Award for its Instagram feed and multiple 2015 Webby awards for its photography and graphics, blogs, and apps. Separately, a number of staff maintain active social media accounts beyond the “official” Met channels. Extending beyond its own networks, #emptymet invites Instagram and social media influencers to the museum for after-hours tours.